There are a couple of memorable ways to get stars in your eyes in Teide National Park. One of them is to go on a stargazing and tapas trip to Mount Teide. On a chilly November early evening we huddled around the lower cable car station with a group of travel writers from across Europe waiting to take a trip with a difference up Teide . We’ve walked up the mountain before and queued to take the cable car on a number of occasions, but this was the first time we’d done it as the sun was setting and the cable car was closed to everyone but those on the stargazing tour. 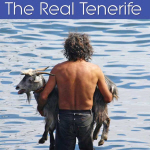 Whilst staff handed out fleeces to anyone who hadn’t come prepared for after dark November temperatures (5C at crater level and -6C on the peak), a goose-pimply family in beachwear luckily found out they’d arrived too late to catch the cable car. I say luckily as given what they were wearing or, more importantly, weren’t wearing, they’d have perished on the peak. In Teide National Park the sun leaves not long after the last visitor, taking warm temperatures with it, but as we climbed from the crater floor it came back into full view. The eight minute cable car is always a hoot, especially when it judders its way past pylons, and the views are such it feels as though you’re heading for a date with the gods. Awaiting us at the top was a glass of cava and a cup of hot chocolate. At 3,555m, where the upper cable car is located, the air is thin. Often you see people looking a bit groggy whilst they adjust to the altitude. Subsequently the bubbly cava took the express route to the head, whilst the hot chocolate was the equivalent of being given a warming hug. 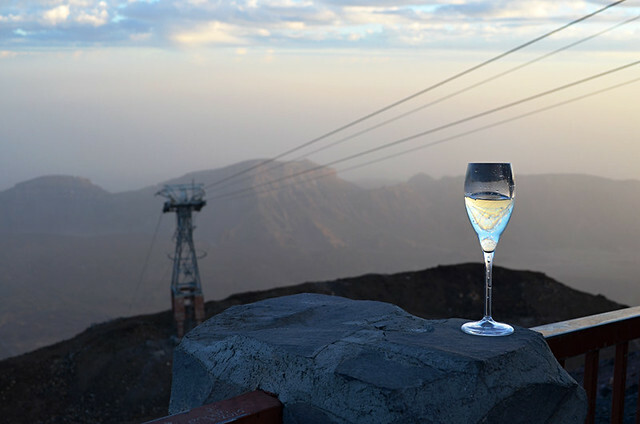 It was a pleasing combination which added to the overall intoxication at being at the top of the world at sunset. 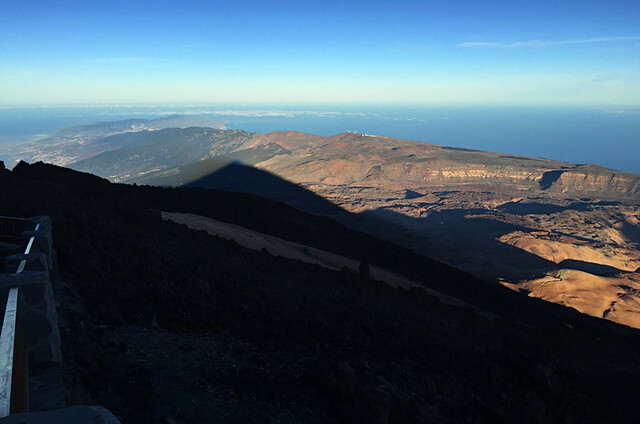 If you’re lucky you get the added ‘WOW’ of seeing Teide’s triangular shadow cast over the Tenerife landscape below. There was a bit of a race against time to get from the cable car station to the viewpoint above Pico Viejo where sunset views are blindingly spectacular. Not all travel journos are of the outdoor activities variety so the rough, undulating and airless path proved a challenge to some. However, most made it in time to watch the ‘performed once nightly’ spectacle as a knowledgeable member of the Teleférico staff kept us entertained with fascinating and amusing snippets. 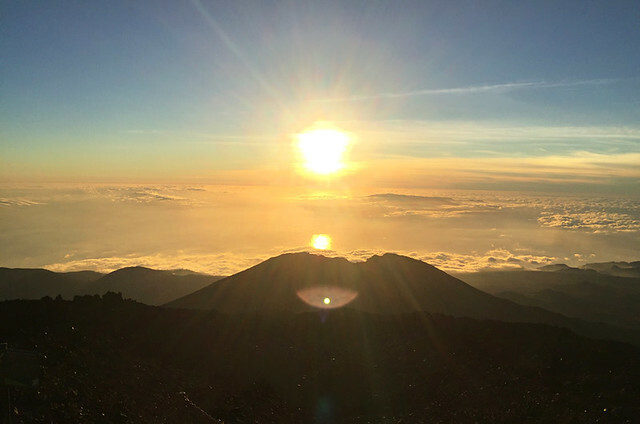 Sunset from Spain’s highest peak is a seriously special experience in itself. But it’s only the first half of the performance. Part two required another race against time. There’s one slight issue with watching the sunset from Pico Viejo, it goes dark afterwards. The light remained just about on the right side of dusky to allow us time to make our way back to the cable car post-haste. Part two of the tour took place in the car park beside the lower cable car station where telescopes had been set up to allow us to peer deep into the night sky and marvel at the mysteries of the final frontier. The first time I went on a stargazing tour in Catalonia I expected something like the closing sequence to the Star Trek movies and was a bit underwhelmed, until I was shown Saturn’s rings. Now my expectations aren’t so out of this world and I appreciate better the beauty in our dark skies. There are 88 constellations in the sky, from Mount Teide you can see 83 of them. 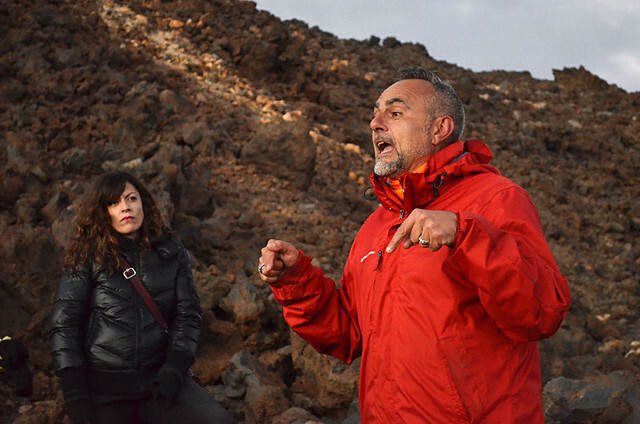 There are peaks on the Moon called Montes Teneriffe. It’s all a bit Twilight Zone to think you might be looking at the Tenerife Mountains on the Moon from Tenerife’s mountain on Earth. 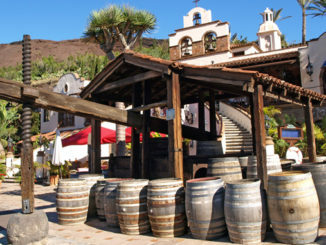 Part of the package also involves a tapas dinner in the lower cable car station. I assumed this would be in the restaurant, but it was in a back room where tables were laid out with a tasty looking selection of Canarian themed tapas which included local cheeses, gofio balls and toasted almonds with honey, carne fiesta, pork and paprika, mini portions of ribs and potatoes, shots of creamed corn and cilantro, cherne, papas arrugadas, almogrote, pumpkin cupcakes and deep fried bananas. 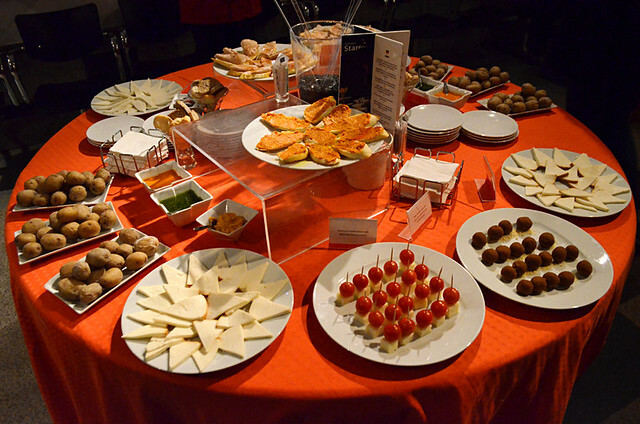 It was an impressive spread, but it was a bit hit and miss. 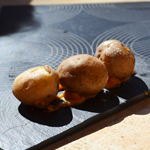 Whilst some dishes were innovatively tasty, the papas were undercooked and the carne fiesta chewy. Since our experience this side of the trip has been changed and the food now features goodies from a menu designed by by Erlantz Gorostiza, the two-Michelin-starred chef of Abama Hotel’s M.B restaurant. That change should make the whole package a hat trick of quite magical experiences. I mentioned at the start there were a couple of memorable ways to get stars in your eyes in Teide National Park. The other is quite simple. Just stand somewhere in the park after dark and look up. The sky up there is a dense black carpet filled with a million sparkling jewels. Every so often a shooting star blazes its way across the heavens, or maybe it’s celestial beings on their way home. 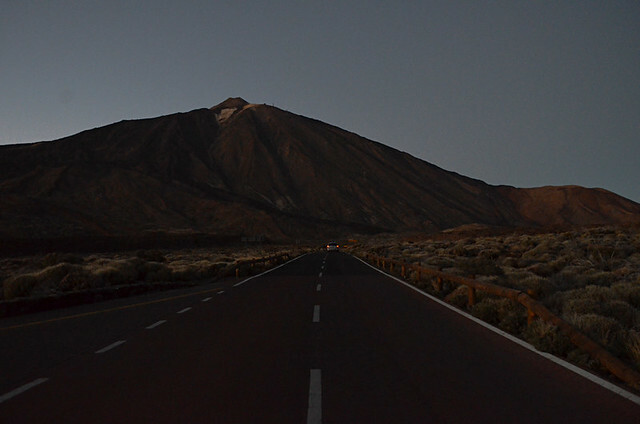 In Teide National Park after the lights go out it’s easy to believe anything is possible. 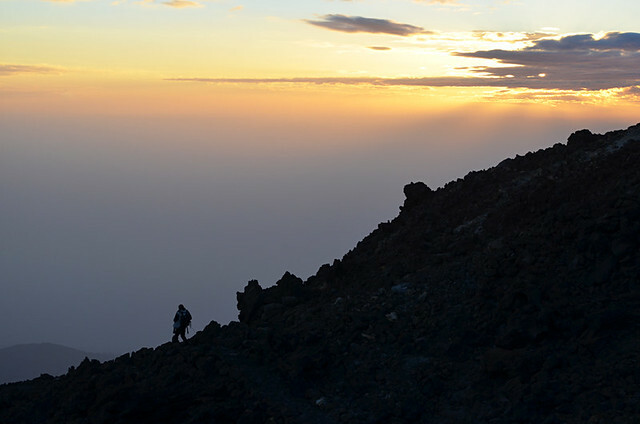 The Volcano Teide experience costs from €81 per person with pick ups in Costa Adeje, Los Cristianos, Puerto de la Cruz and Santa Cruz/La Laguna.